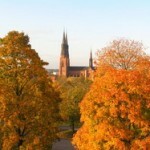 Uppsala is a city in the central part of Sweden located 66 km to the north-west of Stockholm. 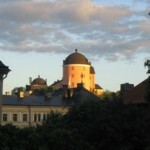 It is an administrative center of Uppsala County in Uppland province. The city is situated on the fertile flatlands on the bank of the Fyris River at its confluence into Lake Melaren. The city is a well-known European university centre opened for the youth of any nationality and religion. 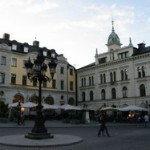 The history of the city is connected with the lives and scientific activities of renowned scholars such as a famous naturalist Carl Linnaeus, an astronomer Anders Celcius, and a chemist Jöns Jacob Berzelius. Moreover, a physician, mathematician, and a rector of Uppsala University Olaus Rudbeck, a chemist Carl Wilhelm Scheele, and a playwright and producer Ingmar Bergman lived and worked there. Talking of history of Uppsala, one should distinguish Gamla Uppsala (Old Uppsala) and the modern city. Old Uppsala, the ancient centre of Swedish Vikings’ kingdom dating back to the 6th – 9th centuries, is located 5 km north of the modern city. Nowadays only royal burial mounds remained on the place of the formerly rich town. 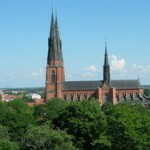 The famous Uppsala Cathedral is the national sacred shrine and the oldest church in Sweden. It is recognized to be the highest church in Scandinavia (118,7 meters high, with the height equal to the length). This impressive building was laid in 1260 when the population of the town made up only 800 inhabitants. The erection of the cathedral continued throughout 175 years. The church was restored for several times after several conflagrations. The latest restoration took place in 1976.